Dec 18, 2018. Szymon successfully defended his PhD thesis. Congratulations, Dr. Calus! Dec 4, 2018. Team MicrobeScope wins the Bioengineering Capstone Cup. Congratulations! June 13, 2018. Ameet received the ISME/IWA BioCluster Award in the Rising Star Category. March 16, 2018. Ameet received 2018 NSF Early CAREER Faculty Award. June 22, 2017. Maria Sevillano wins one of the four best student presentation awards at AEESP 2017 conference. Well done, Maria. March 22, 2017. Press release by EPSRC on comammox bacteria discovery. December 8th, 2016. Melina successfully defended her PhD thesis. Congratulations, Dr. Bautista! Melina is currently a post-doctoral research associate at the University of Michigan. July 11, 2015. Szymon Calus and his team (@puracycle) won the Water Challenge being held over the last three days at the University of Glasgow. Well done, Szymon! March 31, 2015. A small blurb about Ameet's research on the "World Changers Welcome" initiative by the School of Engineering at University of Glasgow. ​July 24th, 2014. New EPSRC project on exploring beneficial biology in drinking water systems was funded today. This project is funded by the EPSRC's Bright Ideas Scheme and involved two stages. Stage 1 was a written proposal and the Stage 2 involved a "Dragon's Den" style interview. June 17, 2014. Dr. Svetlana Ugarcina Perovic (Asst. Prof - University of Novi Sad, Serbia, twitter: @svetlana_up) joins the group as a visiting researcher. Svetlana will be working on biofilms in premise plumbing till the end of September 2014. Her visit is supported by Federation of European Microbiological Societies (FEMS) Visiting Scholarship. Welcome Svetlana! April 1, 2014. Maria Rivera joins the research group as a PhD student. Maria will work on synthetic biofilm assembly. Feb 28, 2014. British Council Researcher Links travel funding application was successful. This award will facilitate a collaboration with Rand Water on mitigation of microbial contamination risks in drinking water system. Feb 28, 2014. EPSRC Sponsorship Award titled "Cell-by-Cell: On Demand Assembly and Control of Microbial Communities for the Water Industry" was funded today. This network grant is collaboration between Ameet, Dr. Yeaw Chu Lee at Heriot Watt University and Dr. James Windmill at the University of Strathclyde. Jan 16, 2014. Two exciting PhD project available. Click here for further details. Jan 8th, 2014. Presenting at the University of Michigan - Civil & Environmental Engineering Departmental Seminar " Developing a predictive framework for microbial community dynamics in drinking water systems". Nov 19, 2013. Melina wins The William Wilson Scott Award and receives £1000 in funding to support her travel to WQTC 2014 in New Orleans, Louisiana. Congratulations, Melina! Oct 26, 2013. Melina wins GU68 prize for and received £500 in funding to support her PhD research. Congratulations, Melina! October 1, 2013. Ameet was invited to attend the "Engineering Leaders of the Future" Workshop organised by EPSRC for early to mid career researchers. The goal of this workshop is to help invited researchers build a stronger relationship with and understanding of the EPSRC and to develop of network of researchers across the UK community. September 10, 2013. Ameet joined the management committee of the International Water Association specialty group Microbial Ecology and Water Engineering. August 22, 2013. "Tapping Potential: What is in our Water?" Article in the Irish Times talks about our research with some quotes from Ameet. August 13, 2013. Application to the Glasgow Research Partnership in Engineering at the University of Glasgow was just funded today. These funds will support the development of research collaborations in continental Europe. July 14, 2013. At AEESP 2013 conference in Golden, Colorado. Presenting a poster on July 15, 2013. July 6th, 2013. Presenting at MEWE 2013 (www.http://www.mewe2013.org) on "Bacterial community dynamics in drinking water system" on July 10th, 2013. June 24, 2013. Oliver starts his summer project supported by the EPSRC Vacation Scholars Program at the University of Glasgow. May 18, 2013. EPSRC First Grant Scheme application was funded today. This project is the first step towards developing an event prediction and correction framework for microbial contamination in drinking water systems. April 16, 2013. The John Robertson Bequest has funded our study aimed at characterising the drinking water microbiome across multiple drinking water facilities in Scotland. February 11, 2013: We were awarded the Royal Society Start Grant to develop a bacteriophage based sensor for detecting pathogens in drinking water. 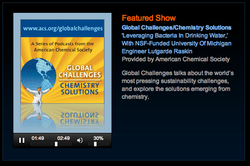 December 6, 2012: ES&T paper featured on ACS radio podcast. December 1, 2012. Melina joins the lab. 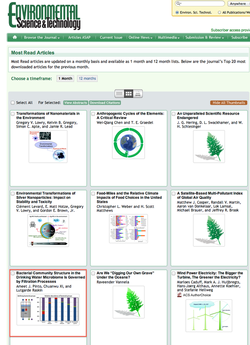 September 14, 2012: ES&T article on the journals most read list for the month (click below image). August 28, 2012: ISME-14 was fantastic. Learned a lot and met several wonderful microbial ecologists. Our drinking water work was presented in the Managing Microbial Communities session. Other collaborative contributions to ISME-14 included a presentation by Jo Schroeder (Bill Sloan Group -Univ Glasgow) and poster by Tara Clancy (Raskin Group – Univ Michigan). August 10, 2012: ES&T article in media: University of Michigan press release, ACS press release,The Scientist, CBS news detroit, NewScientist, The Atlantic, Science Daily, News-Medical.net, Examiner.com, esciencenews, wateronline.